Hearthstone Estates Assisted Living is truly a unique opportunity for the discerning individual. What is it that distinguishes Hearthstone Estates as an ideal living situation for seniors? The right size - Hearthstone Estates consists of just 39 apartments, the perfect size for a warm, friendly, and engaging community. Hearthstone Estates is not part of a bigger complex with other facilities attached; we're an Assisted Living Community, period. The right place - Hearthstone Estates is located in a peaceful setting but within close proximity of local conveniences, area highways, and major medical centers. The building and grounds are beautiful and are meticulously maintained. 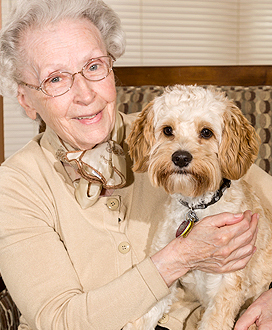 The care you want - Hearthstone Estates provides a full range of supportive healthcare and living services that enable seniors to live independently in their own apartments. Outstanding staff - The friendly and devoted staff of professionals plays a big role in making living at Hearthstone Estates such a wonderful experience. They are dedicated to ensuring that each community member's needs are met quickly and efficiently. Familiar faces - Hearthstone Estates features exceptional longevity of staff. Having familiar friendly faces creates a sense of comfort and security for community members. Individuality - Hearthstone Estates is not a “one-size-fits-all” community; it’s whatever you want it to be. You can enjoy the social and recreational opportunities as much or as little as you please; decorate and furnish your apartment to suit your taste - it's yours!